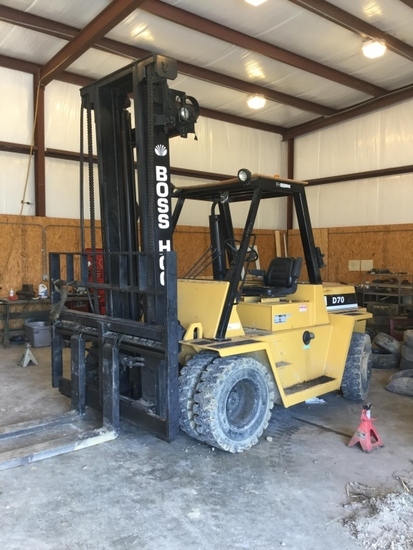 Settling an estate and selling skid steers, forklifts, implements, yard mule, trailers, restored antique Ford, 1976 Rolls Royce, tools, welders, air compressors and more! Payment Instructions: Internet Premium: 18% Participation Requirements: Valid Credit Card required for bidding approval Payment Options: Visa, MasterCard, American Express, and Wire Transfer Payment Instructions: For online bidders we accept MasterCard, Visa, & American Express. WE DO NOT ACCEPT CHECKS OR MONEY ORDERS! Payment must be made within 24 hours from close of auction. We will bill your credit card on file for purchase amount (including buyers fee) and then we will get a shipping cost and bill your credit card for shipping. Winning bidders will pay actual shipping, insurance and $10 per item packaging costs. . All shipping charges will be billed to the credit card you registered with in a separate bill. If your card is declined there will be a $25 service for using an additional card. Bidders picking up at auction location and Alabama residents will pay 9% sales tax unless you have an Alabama Sales Tax number on file with the auctioneer. Shipping Instructions: All items can be shipped at the cost of the buyer. Contact Redfield Group Auctions for more details on shipping. We will have Loadout times on the day of the Auction, and also have loadout on Sunday & Monday. Preview Date & Times: Preview date is Tuesday, January 22nd from 10-2. Checkout Date & Times: Payment must be made within 24 hours of close of auction. Any items not picked up within 7 days will be sold for storage. ALL SALES ARE FINAL and there are no refunds or exchanges. No warranty is expressed, written or implied. We try to list these items as accurately as we can however we are not experts on all the items we sell. We offer an on-sight preview the day of auction. Should you not agree with our terms, please don't bid because you will be held to them. Payment Terms All payments must be made within 24 hours of auction close. Internet Premium: 18% Participation Requirements: Valid Credit Card required for bidding approval Payment Options: Visa, MasterCard, American Express, and Wire Transfer Payment Instructions: ALL PAYMENTS FOR INVOICES UNDER $5,000 MADE BY ONLINE BIDDERS MUST BE DONE SO VIA WIRE TRANSFER OR CREDIT CARD ON FILE. ALL INVOICES OVER $5,000 MUST BE PAID BY WIRE TRANSFER ONLY. No Exceptions. Wire transfer information will be sent with your invoice after the auction closes. All invoices must be paid within 24 hours of auction close. Special Terms All property is sold “AS IS”, and ALL SALES ARE FINAL. Property is open to thorough public inspection. It is the Bidder’s responsibility to determine condition, age, genuineness, value or any other determinative factor. Redfield Group Auctions, Inc may attempt to describe the merchandise in advertising, on the internet and at the auction but makes no representations. In no event shall Redfield Group Auctions, Inc be held responsible for having made or implied any warranty of merchantability or fitness for a particular purpose. Bidder shall be the sole judge of value. Bidders who bid from off site and are not present at the live auction or preview understand and acknowledge that they may not be able to inspect an item as well as if they examined it in person. It is the Bidder’s responsibility to determine condition, age, genuineness, value or any other determinative factor. Redfield Group Auctions, Inc shall endeavor to describe in detail each item and any pertinent information about it. Redfield Group Auctions, Inc will not be responsible for any errors or omissions in the description of the merchandise. Bidder agrees that everything is sold as is and that they may not return any item they purchase. Redfield Group Auctions, Inc is providing internet pre-auction and live bidding as a service to Bidder. Bidder acknowledges and understands that this service may or may not function correctly the day of the auction. Under no circumstances shall Bidder have any kind of claim against Redfield Group Auctions, Inc or anyone else if the internet service fails to work correctly before or during the live auction. Redfield Group Auctions, Inc will not be responsible for any missed bids from any source. Internet bidders who desire to make certain their bid is acknowledged should use the proxy-bidding feature and leave their maximum bid 24 hours before the auction begins. Redfield Group Auctions, Inc reserves the right to withdraw or re-catalog items in this auction. Purchaser is responsible for all document transfer fees. The auction company shall not be held responsible for any "missed" bids or bids unseen by the auctioneer. All items must be removed by November 30th , 2018 at 5:00 PM cst. All items are outdoors in a location that WILL NOT BE SECURED. Redfield will not be responsible for items after bid is accepted. An 23% Buyers Premium will be charged on all items. 1. The catalog is a guide only and the Auctioneer believes the descriptions contained herein to be correct, but makes no warranty in connection therewith. Descriptions shall not be relied on for accuracy or completeness. Bidders/Buyers shall be deemed to have inspected all items sold at Auction ("Items") before bidding and to have relied solely on their own inspections and investigations. Auctioneer and seller shall not be liable for any inaccurate description of any Item or lot whether contained in a catalog, advertisement or otherwise. 2. Auctioneer reserves the right to bid for its own account and for the accounts of others, whether by verbal or written proxy, all lots are subject to prior sale. 3. Auctioneer reserves the right to refuse any applicant the privilege of bidding or attending the Auction and may revoke such privilege at any time. Bidder acknowledges and agrees that Bidder's paddles are nontransferable. All bids made by the holder of the paddle are the responsibility of the registered bidder. A successful bid at Auction constitutes a legally binding contract of sale, subject to the Terms set forth herein. 4. All Items will be sold to the highest bidder conforming to the bid process, provided that Auctioneer reserves the right to sell Items by individual, group lots and "in bulk," as Auctioneer deems appropriate. Auctioneer reserves the right to sell on behalf of third parties, its own account or on the account of others. Should any dispute arise between two or more bidders or as to any bid, the lot in question may, at Auctioneer's discretion, be immediately put up again and resold. Auctioneer shall regulate all matters relating to the conduct of the auction and his decision shall be final and binding on all bidders. The record kept by the Clerk of Sale, shall in all cases be accepted by the bidder as final. 5. All sales shall be concluded as indicated by Auctioneer and no Bidder/Buyer may thereafter revoke his bid. Title shall not pass until payment in full of the purchase price is received. 6. All sales are FINAL. No refunds, returns, credits or exchanges. All Items are sold on an "AS IS" " WHERE IS" AND" WITH ALL FAULTS BASIS" WITHOUT EXCEPTION and WITH REMOVAL AT BUYER'S SOLE RISK AND EXPENSE. THE AUCTIONEER AND SELLER MAKE NO REPRESENTATIONS, WARRANTIES, PROMISES, COVENANTS OR GUARANTEES OF ANY KIND, EXPRESSED OR IMPLIED, AS TO THE NATURE, QUALITY, DURABILITY, CAPABILITY, FUNCTION, PERFORMANCE, VALUE OR CONDITION OF THE ITEM(S) BEING AUCTIONED OR ITS SUITABILITY FOR ANY USE. AUCTIONEER AND SELLER EXPRESSLY AND SPECIFICALLY DISCLAIM, WITHOUT LIMITATION, ANY WARRANTY OF MERCHANTABILITY OR FITNESS FOR A PARTICULAR PURPOSE. 7. All payments shall be within 24 hours of the Auction closing. 8. No Item shall be removed unless paid for in full and Items purchased shall be removed within the guidelines and terms stipulated. Buyer shall be responsible for all the costs of removal and shall be liable for all damages, including without limitation, any environmental damage, caused during or as a result of the removal. Buyers shall comply with all environmental laws and regulations including requirements as to bonding of movers. No claims shall be allowed after removal of the purchased Items. 9. Where available, documents of transfer, including motor vehicle ownership documents, which are in possession of Auctioneer, will be provided to the Buyer following the Auction or as soon thereafter as such documents are available and payment has been made. 10. Buyer may not assign, transfer or dispose of his rights in any Item purchased before payment of the purchase price in full. 11. Buyer shall pay all relevant taxes. All relevant taxes shall be Buyer's sole responsibility. 12. Time is of the essence. If Buyer fails to make payment or remove Item(s) within the time periods provided herein, the Auctioneer may resell the Item(s) purchased by Auction, private contract or otherwise, as Auctioneer in his discretion deems advisable, and Buyer shall be liable for the shortfall and all costs expenses, including but not limited to interest rates (a minimum of 1.5% per month or 18% per annum), legal fees, moving fees, storage (a minimum rate of $2.00/sq. ft. per month) and commissions incurred such as resale. 13. The Auctioneer assumes no responsibility or any liability once title passes, which occurs at time of payment in full. Buyers are advised to prearrange for insurance coverage of their purchase. Title will revert to the Seller in the event Buyer does not remove Item(s) within the time specified. 14. If the Auctioneer is unable to deliver an Item sold to a Buyer due to fire, theft or any other reason whatsoever, the Auctioneer shall reimburse Buyer for all monies paid to the Auctioneer in respect of the Item and the Auctioneer shall have no further liability to Buyer arising from or relating to such loss, including without limitation, any damages or loss of profits. 15. Bidder acknowledges that the location at which the auction is held (the "Auction Site") is a potentially dangerous place with metal working equipment, metal shavings, industrial equipment, heavy equipment being operated and electric circuits being live. Every person at the Auction Site before, during and after the Auction shall be deemed to be there at their own risk with notice of the condition of the premises, the activities on the premises and the conduct of third parties, and the Bidder shall so advise his/her agents and employees. No person shall have any claim against the Auctioneer, his agents, employees or principals or the seller for any injuries sustained for damages to or loss of property which may occur from any cause whatsoever. 16. Alabama law shall govern the interpretation and enforcement of these Terms. All disputes arising out of, related to, or in connection with therewith shall be resolved solely through arbitration, pursuant to the then current rules for commercial arbitration of the American Arbitration Association, with all hearings to be held in Gadsden, AL. Should any legal proceeding be commenced regarding the Auction, the Item(s) and/or the Auction Site, the prevailing party in such proceeding, whether by final judgment or out-of-court settlement, shall be entitled, in addition to such other relief as may be granted, to an award of all reasonable attorneys' fees. These terms and conditions together with any amendments or modifications, expressly made by the Auctioneer at the time of the Auction constitute all the Terms with respect to the sale of Items at this Auction. There are no representations, warranties, terms, conditions, undertakings or collateral agreements except as hereinabove provided. EQUIPMENT REMOVAL PROCEDURES/ TERMS & CONDITIONS The following are the controlling procedures and Terms and Conditions for the removal of Items purchased at a Redfield Group Auctions, Inc. ("Redfield") sale: 1. Rigging/Removal of sold equipment is the sole responsibility of the buyer and must be completed by the posted date. Rigging/Removal may not begin until payment has been made in full and the auction sale is complete. All heavy rigging requiring the use of forklifts, cranes, etc whether performed by the customer or a rigging company, must present a certificate of insurance for $1,000,000.00 naming Redfield Group Auctions, Inc. as the insured. Recommendation or approval of Riggers by Redfield Group Auctions, Inc. by any employee, agent thereof or by any affiliated entity of Redfield Group Auctions, Inc., shall be done only as an accommodation to the Buyer. Such recommendation or approval shall not cause Redfield Group Auctions, Inc. to be liable in any way for any act or omission of any such Rigger. Selection of a Rigger is solely within the discretion of the buyer, and Buyer acknowledges and agrees that it shall have no rights or remedies against by Redfield Group Auctions, Inc. by any employee, agent thereof or by any affiliated entity of Redfield Group Auctions, Inc. based upon any act or omission by a Rigger. 2. Buyers are responsible for, at their expense: (a) proper and safe disconnection and termination of all electrical, gas, water and/or air lines to machines as instructed or directed by an authorized RGA representative; (b) shearing flush to the floor of all anchor bolts or fasteners; (c) erecting safety barriers around pits and holes in the floor created by removal of equipment until repaired (see next); (d) repair, in a first class, proper workmanlike manner, all holes in the floor or roof created by the removal of items purchased; (e) removing, off premises, all hazardous materials (including all contaminants) contained in Items purchased; (f) repairing, in a first class, proper workmanlike manner, all damage caused to the premises by a Buyer, its representative or any other party hired by a Buyer for the removal of Items purchased; (g) leaving the work area in a clean, broom-swept condition; (h) any other specific terms and conditions communicated by Redfield before, during or after the Auction sale; (i) removal of Items purchased by the time and date set by Redfield before, during or after the Auction sale; and (j) the safety of all of a Buyer's employees, agents or representatives including all movers/riggers hired by such buyer. 3. Prior to removal, all Buyers, or any movers or riggers hired by a Buyer, must provide to Redfield a certificate of insurance evidencing at least $1,000,000 in comprehensive liability insurance coverage (including workers compensation and automobile) per person, per occurrence. 4. Prior to removal, an authorized Redfield representative must examine and approve the removal of all Items purchased at the Auction. Such approval shall be indicated by this representative initialing all invoices. 5. Buyers and their movers/riggers are jointly and severally liable for all damages, costs and expenses to the premises or any other assets which were caused by any of them, their employees, agents or representatives whether through negligence or otherwise. Buyer indemnifies and saves Redfield harmless from any and all costs, expenses and claims suffered or incurred by Redfield as a result of any act or omission of such buyer and/or any mover or rigger retained by a Buyer. NO ITEMS SHALL LEAVE THE PREMISES UNTIL THE ABOVE HAS BEEN COMPLIED WITH REDFIELD's SATISFACTION. NOTE: Buyers, please provide all movers or riggers hired by you with a copy of these procedures/terms and conditions as you will be held liable for their conduct. 6 Cylinder 65 HP Made in Toledo, Ohio Check photos! 1976 Rolls Royce w/ Only 50K Miles! 3148 Hours Runs and Operates Comes with 6ft Wide Bucket Check photos and video! You've been outbid to H****0! to YOU! 1901 oldsmobile replica carriage Collectors Item that is hard to find! Have registration card for the carriage! Teal & White Teal Interior that is in good condition Paint looks to be in god shape along with the seats and the interior of the car! Check the photos for more information! Teal & White Teal Interior that is in good condition Paint looks to be in god shape along with the seats and the interior of the car! Check the photos for more informati...moreon! Mercruiser 140 Inboard 6 Person Capacity Last Registered in 2017 Needs a little TLC and will be river ready for the Summer! Mason & Gamlin Grand Piano Large Piano Could be restored easily Very Rare and Hard to find! Located in Rainbow City Alabama about 15 miles from where the Live Aucti...moreon is taking place.